ALEXANDMUSHI are ‘artists as anthropologists’. Using art systems to isolate different forms of verbal and nonverbal languages across multiple cultures they examine the unifying core forms of communication and connection. 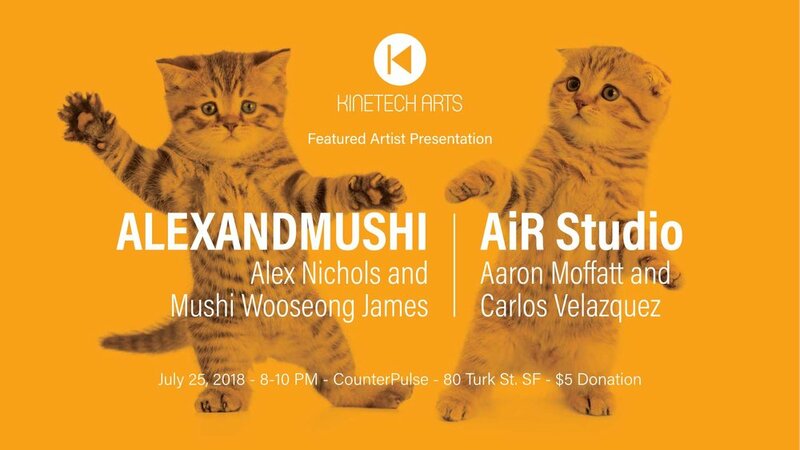 As collaborators, Alex & Mushi span different generations, languages, cultures, and genders. They learn about the ‘other’ through intimate dialogue and use art to unravel what is inexplicable. Understanding their own differences is merely the starting point of the collaboration. They practice working together over time and understand that there are multiple truths. Through transparency and clarity Alex and Mushi are able to share perspectives and in turn expand their vision. At its core, AiR Studio is an XR software toolset, created by individuals united by a passion to shape the future of virtual and augmented world technologies in a way that connects people with the planet upon which we call home. Our platform empowers storytellers to render artistic, interactive visualizations of music, realtime sound, and physical world locations on all modern XR and Non-R devices. Aaron Moffatt began as a digital artist at age 7, driven by a childhood desire to merge imagination and real-world through 3D illustrations. Today he works as a VR software engineer, cinematographer, nature documentary filmmaker, writer, and concert violinist. Carlos Velazquez brings over 19 years of experience on the cutting-edge of 3D scanning. He has developed and implemented LiDAR systems since 1999, implementing projects around the world across various industries — like architecture, archaeology, civil engineering, forensic analysis, historical preservation, maritime industries, mining, nuclear, and oil & gas.